The LinkedList in Java is a class present in java.util package. LinkedList class is a part of the Java Collection Framework. The LinkedList extends AbstractSequentialList and implements the List interface and Deque interface. LinkedList class in Java provides a linked-list data structure. Java LinkedList class uses the concept of the doubly linked list to store the elements. In the doubly linked list, we can add or remove the elements from both sides. 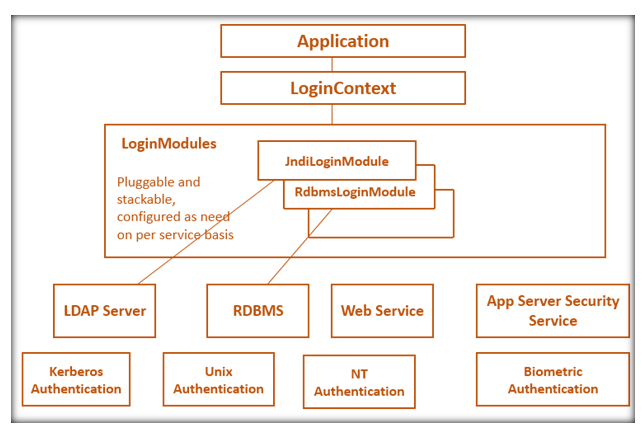 Java LinkedList is the best choice if we want to perform operations such as insertion or deletion in the middle of the list. It also has a disadvantage if we want to access a node, the nodes cannot be accessed directly instead we need to start from the head and reach to the node we want to access. 1. LinkedList(): The first constructors in used to builds an empty linked list. 2. 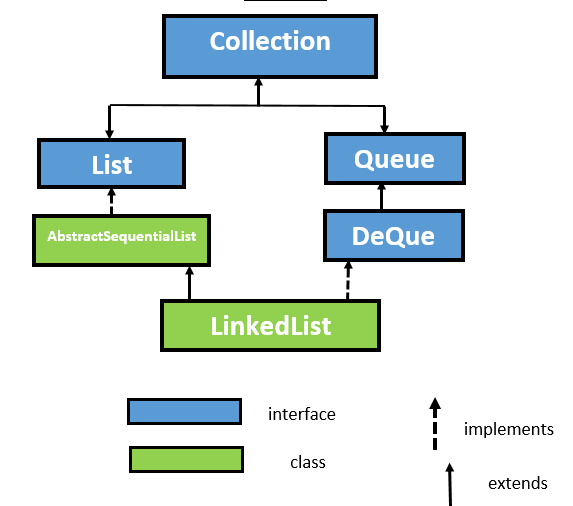 LinkedList(Collection c): The second constructor is used to builds a linked list that is initialized with the elements of the collection c.
How to Create a LinkedList? This statement creates a linked list with the name list which is of type "String". The type determines which type of elements the Linked List should contain. Since it is of type String, the elements that are going to be added in this list will be of String type. 1. boolean add(E e): This method is used to add specified elements at the end of the list. 2. void add(int index, E element): This method is used to add the specified element at a given index. 4. boolean addAll(int index, Collection c): This method is used to add all the elements of the specified collection c to the given index of the list. 7. void clear(): This method is used to remove all the elements from a list. 8. boolean contains(E e): This method is used to find out the specified element from a list, it returns true if the list contains specified element otherwise it returns false. 9. E get(int index): This method is used to returns the element at the specified position from the list. 10. E getFirst(): This method is used to returns the first element from the list. 12. int indexOf(Element e): This method is used to returns the index of the specified element. It returns -1 if the list does not contains specified element. 13. int lastIndexOf(Element e): This method is used to returns the index of the last occurrence of the specified element from the list. It returns -1 if the list does not contains specified element. 14. E remove(): This method is used to remove the first element from a list. 15. E remove(int index): This method is used to remove the element from the list which is present at a given index. 16. E removeFirst(): This method is used to remove the first element from the list. 17. E removeLast(): This method is used to remove the last element from the list. 18. boolean removeFirstOccurrence(Object item): This method is used to remove the first occurrence of the specified item when traversing the elements from head to tail. 19. boolean removeLastOccurrence(Object item): This method is used to remove the last occurrence of the specified item when traversing the elements from head to tail. 21. int size(): This method returns the number of elements which is present in the list. 22. E set(int index, Element e): This method is used to replace the item of the specified index with the given value. add(int index, Element e), addFisrt(Element e), and addLast(Element e). If you want to add an element at the end of the list then you can use the addLast() method. If you want to add an element at the specified position in the list then you can use add(int index, Element e). // add element at 3 position. We can remove elements from a linked list by using the following methods remove(), remove(int index), removeFirst(Element e), and removeLast(Element e). If you want to remove an element at the end of the list then you can use the removeLast() method. If you want to remove an element at the specified position in the list then you can use remove(int index). // removing an element from the 3 position. We can use the getFirst() method to get the first element from a list and getLast() method to get the last element from the list. 1. ArrayList is implemented with the concept of dynamic arrays while LinkedList is implemented with the concept of a doubly linked list. 2. ArrayList is slow because it internally uses the concept of arrays. If we want to remove any element from an array, all the bits are shifted in memory. LinkedList is faster than ArrayList because it uses the concept of a doubly linked list, so bit shifting is not required in memory. 3. ArrayList is best if we want to store and access the data while LinkedList is best if we want to manipulate the data. 4. ArrayList acts as a list because it implements only list interface while LinkedList acts as a list as well as queue because it implements list and Dequeue both interface.